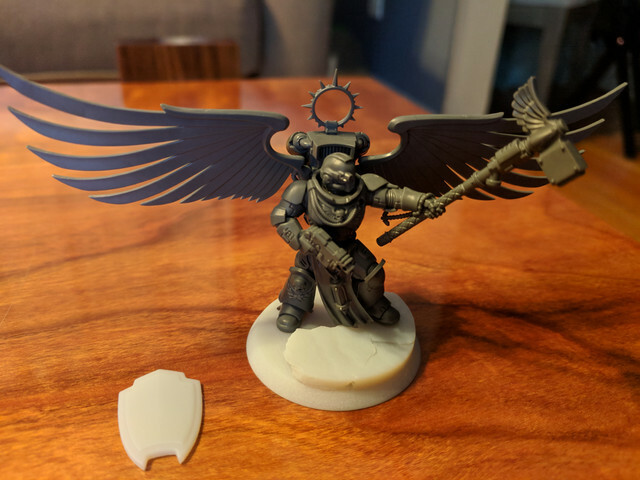 Based mostly on the Primaris Captain model with bits from Celestine, Sanguinary Guard, Primaris Chaplain, and BA Terminator Captain thrown in. A lot of it is just pinned right now like the pistol arm, wings, and head. I'll be switching the head to something more BA appropriate once I decide which one I want to use and the left pauldron will be from the BA Primaris upgrade kit, I'll stick with what came with the Primaris Captain for the right pauldron. The base and shield I made myself with the 3D printers I use at work. He's going to remain unpainted for a while unfortunately, as I'm currently saving up for an airbrush. Great start! I think the thunder hammer looks a little unbalanced - he is holding it too low on the haft to look correct. Also, I think if you are going to have the shield on him, you should drop the pistol arm and replace it with some more heroic looking to correspond with the rest of his pose. Otherwise, great start and anxious to see where you go from here! Show us some more at different angles! Celestine wings are a nice shout, but with their size and position maybe he needs to be on a flying stand with some different legs? It’s very cool, I like the idea a lot. I will be doing something quite similar soon, but using the powefist special ed. captain as a base. Doing this as I already have the normal Primaris captain and don’t want twins! One thing worth bearing in mind - rules wise you are obviously using the normal captain data sheet. In friendly club games I’m sure no one cares, but at events and such you will find occasions where they are not happy that he’s on a 40mm base, as the normal captain (which is what he actually is) is on a 32m. Somewhat relevant as he has an aura and a bigger base extends it a little. As I say, very few people will care, but if you want to attend tournaments definitely something to be mindful of. The only reason I’m thinking about it is I’m doing the same and thinking how to solve for it! Usually TOs don't care too much about base sizes unless the difference is extreme. There's no rule for base sizes after all and bigger bases have about as many disadvantages as they have advantages. If you have conversions that are out of the norm it's always advised to contact and ask the TO beforehand tho. The general rule is that the model should be based on the base size that the model is currently sold with. As I say, the reason I’m thinking about this is that I’m presently doing the exact same conversation and am worried about it!